The ultimate in architecture, design and workmanship, apartment 5B at 284 Lafayette Street is an extraordinary pre-war home with beautifully executed interiors and an attention to detail rarely conceived in loft renovations. With so many wow moments from the instant one arrives in the space, this 2,500-square-foot loft offers two luxurious bedrooms, two and a half bathrooms, twelve massive windows, 10-foot ceilings and an ingenious floor plan spanning 57 feet wide. Stripped down to the studs in 2014, 5B has undergone a state-of-the-art renovation including brand new HVAC, electrical, plumbing and mechanical systems. 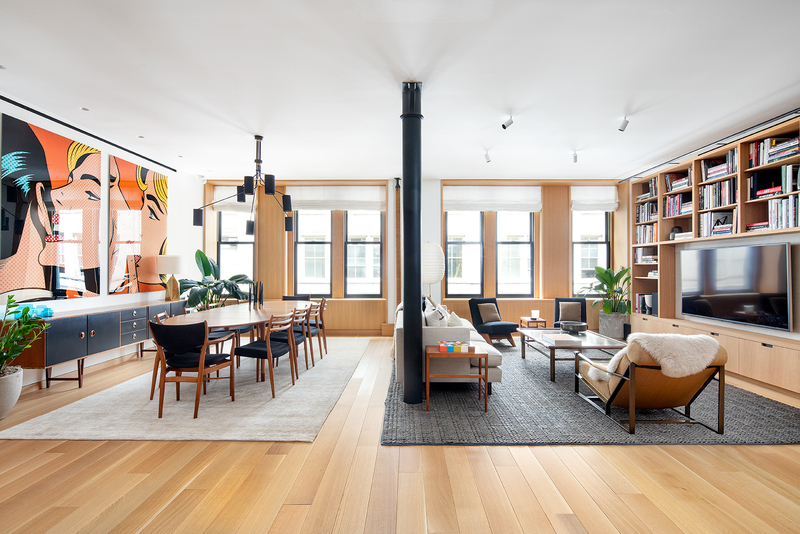 Gachot Studios, a Soho based multi-disciplinary design firm known for projects such as the Shinola Store, Acme, and Royal Palms Shuffleboard Club, oversaw this timeless yet radical transformation. Enter the loft through a matte black door and immediately one understands how special the space is. Exposed brick, rift cut white oak flooring and 10-foot ceilings are just a few of the loft's defining features. The 26'4'' x 22'8'' great room offers the best in scale, volume and drama with six massive windows facing west over Crosby Street, original cast iron columns painted panther black, floor-to-ceiling white oak millwork in the living room, custom lighting throughout and a 26-foot long open kitchen featuring Calacatta honed marble countertops and backsplash, absolute black granite countertops on the island; a Wolf, Sub-Zero and Miele appliance package, multiple pantries and a separate bar area with wine cooler, two under-counter refrigerators and a fumed mirrored backsplash. The kitchen is larger than what one would experience in most four bedroom homes and can easily be used as an eat-in kitchen, or remain the focal point of grand entertaining. A vented hood and in-sink garbage disposal complete the list of elements that rarely exist in a pre-war kitchen. The master bedroom holds true to its name due to its sheer size and scale. In addition to accommodating a king size bed and a reading chair, it offers the optionality to also have a home office or library, a massive dressing area or another seating space; all within the existing bedroom footprint. One could even carve out a separate home office or a third interior bedroom given the amount of space currently allocated to the master. The walk-in closet is a true walk-in and is beautifully outfitted with the same oak millwork seen throughout the home. The showpiece master bathroom is clad in slabs of Nero Marquina marble and features a custom vanity with bronze legs, oil rubbed bronze fixtures by Lefroy Brooks and multiple medicine cabinets for storage. The walk-in steam shower for two has dual shower heads and a large bench akin to the best spa in town. There is also a separate water closet for maximum privacy and comfort. On the opposite side of the loft is a large and bright second bedroom with a black monochromatic bathroom featuring a large walk-in shower, black subway tiles, custom vanity and light fixtures and a separate toilet. There is also a wall of custom oak millwork with closets, drawers and counter space for extra storage. 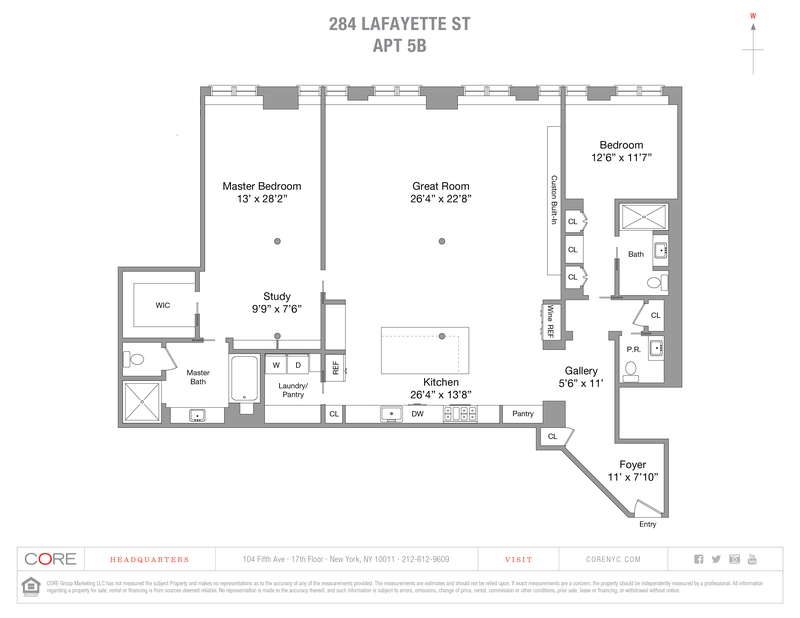 Two more closets, a walk-in kitchen pantry and the stunning powder room are additional components of this masterful loft floor plan. Designed with all of the comforts and conveniences expected in a luxury home today, 5B offers multi-zone central cooling and heating, a Crestron home automation system, in-unit vented laundry and brand new landmark approved windows.